Dorm Co. Tip: Go Bold or Go Home! Dimensions: 30" x 15 3/4" x 12 1/4"
The best dorm room decorations are the ones that look cool and serve some type of purpose. Our 30'' Collegiate Footlocker is both a unique dorm room decoration and a useful dorm organizer and space saver. Place it at the foot of your bed or next to your dorm desk to store clothes, food, shoes, or anything else that you need out of your way. While some dorm room organizers are supposed to be placed underneath your bed, or the back of your closet, our Collegiate footlocker should be seen and displayed. 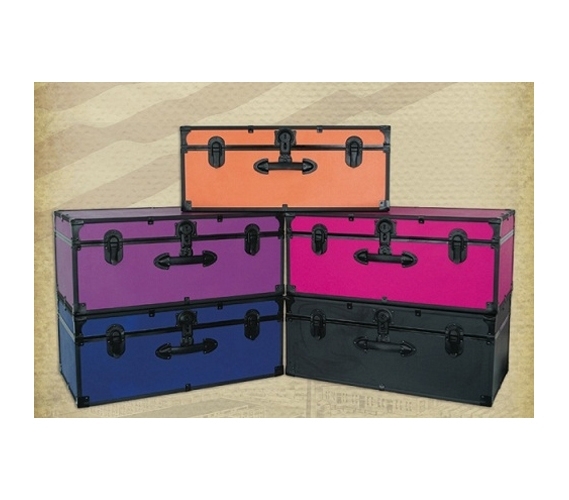 Available in bright colors like orange, green, pink, and blue, the heavy-gauge vinyl covering of our dorm trunk is sure to stand out and decorate your dorm room. The black hardware outlining and durable wooden construction of this college organizer are both decorative and functional. Made with no sharp edges or flimsy material, our dorm footlocker is a college supply that you can use year after year. You can also use our dorm trunk to make moving into your dorm room easier by filling it with your other smaller college supplies. Even if this dorm trunk is one of your larger dorm room accessories, it will end up saving you space and keeping your room neat because of all the storage it provides. So save space, add decoration, and keep your room clean with our must have dorm room footlocker.